Ob Luang National Park is an amazing natural attraction comprising both splendid natural charms as well as mysterious scenery. A zigzagging river flows in front of a picturesque gorge. The area is a high, steep cliff with a narrow passage, creating strong currents and powerful echoes. An area in the north of this stream is teeming with various kinds of plants that provide a pleasant ambience all year round. Magnificent views of Ob Luang National Park can be seen from the bridge that links with the gorge. An interesting prehistoric archaeological site is also located in the park. Getting there: The Ob Luang National Park is located 105 kilometres from Chiang Mai town along Highway No. 108 (Chiang Mai-Hot-Mae Sariang) at Km.17 on your right. 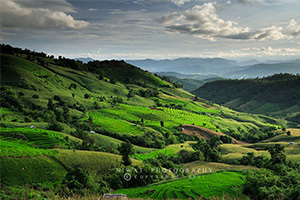 The road stretches alongside the Mae Chaem River and zigzags along mountain ranges. Bus from Chiang Mai town starts from Chiang Mai Gate, catch Chiang Mai-Hot –Omkoi route. Or from Amphoe Hot, there are 3 lines of buses: Hot-Mae Sariang, Hot-Mae Chaem, Hot-Omkoi from the Hot roundabout. All of them stop at Ob Luang National Park.